With five semesters of Student Government Board under his belt, Matthew Sykes has his eyes on the President’s gavel. Starting in his first year of college, the senior industrial engineering major first helped his Resident Assistant run for a Board seat and later ran for a seat on the Allocations Committee. He served on Allocations Committee for a year, then successfully ran for a Board seat in fall 2014. Now, in the middle of his sixth semester on Board, Sykes is doubling down on mental health awareness, an issue he’s focused on heavily in SGB. And as he’s campainged, Sykes has said he’ll continue to advocate for mental health awareness and the mental health needs of students if elected to the presidency. “Right now at Pitt, a student could spend up two weeks waiting for their appointment with the counseling center here,” Sykes said. For him, that fact alone is unacceptable, though a statistic he frequently cites — that one in four Pitt students will experience some type of mental health issue during their time on campus — has motivated him to push for a seat on Pitt’s Mental Health Task Force, a coalition of students and administrators who addresss the mental health needs of students. Pitt’s Counseling Services offer free counseling to students, but Sykes said that isn’t enough — he wants to change the culture surrounding mental illness. As part of his work with the Task Force, Sykes said Pitt is now planning to hire an additional six counselors by the summer to work in the health center. To do it, he said, he met with vice provost and dean of students Kenyon Bonner, who works with the members of SGB and who serves on the Task Force, who drafted the proposal to fund for the additional counsellors. Sykes cites that success as an example of his ability to follow through with his projects. Aside from the closed-door Task Force meetings, Sykes also helped organize Stories Untold, an art exhibit open now through March 4 at Frick Fine Arts, and promoted a mental health awareness campaign called Talk About It. With Talk About It, Sykes said he helped the group change their slogan from “Give depression a voice,” to “Give mental health a voice,” making the group more inclusive to students who may suffer from anxiety, bipolar disorder or schiophrenia. Sykes’s commitment to addressing concerns about mental health at Pitt is considered by his peers and colleagues to be one of his greatest strengths. Board member Meghan Murphy, who also serves on the Task Force with Sykes, said she’s seen his commitment to educating students about mental health during their concurrent terms. “He likes to find the easiest way to bring established frameworks and programs to better address mental health concerns at Pitt,” Murphy, a junior neuroscience and political science major, said in an email. According to Sykes, the most important part of being a good leader is being selfless, committed and connected with the student body. “Right now I feel like there’s a disconnect between the students and their representatives on the SGB, they don’t feel like they’re being represented,” Sykes said. Sykes also wants to encourage students to be active themselves in SGB. Recent elections have included a minimal number of candidates, something Sykes wants to change. “For many students, they don’t find out about SGB until the elections come around, so it can be intimidating to jump into SGB then,” Sykes said. Sykes said if he’s elected, he’ll work on dispelling misconceptions about SGB in hopes of getting more students involved, but his main focus remains on mental health services and awareness. 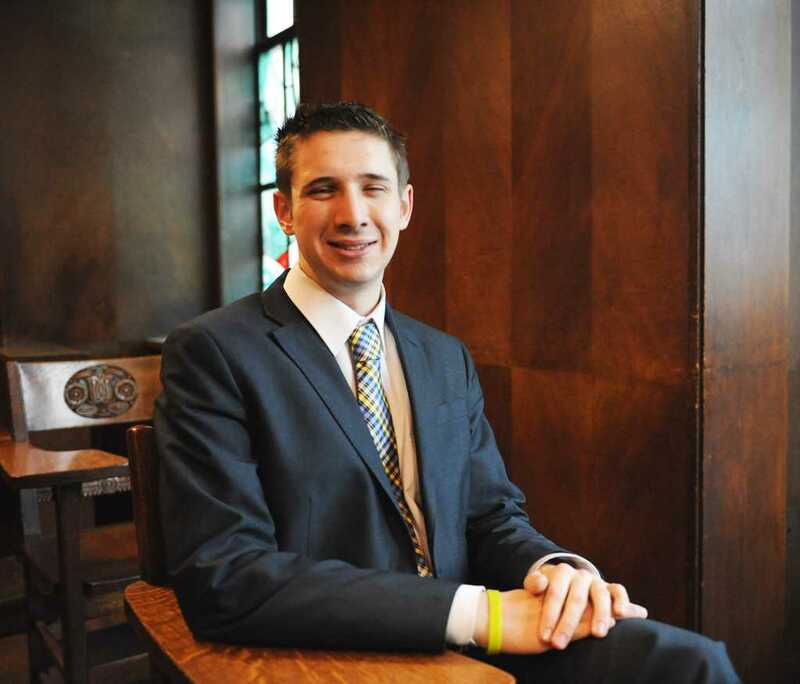 Daniel Lampmann, junior communication and rhetoric major and former SGB press secretary, has worked closely with Sykes throughout his time on the Board. Lampmann recounted a project he and Sykes are currently working on for the Pitt chapter of Students Consulting for Nonprofit organizations. During an event at the Islamic Center of Pittsburgh, they found ourselves in a conversation with the Art Director of the Carnegie Art Museum and the Co-Founder of Conflict Kitchen. “It was an amazing experience to listen to those professionals discuss their ideas about how the city of Pittsburgh could become more welcoming to refugees,” Lampmann said. Lampmann, who helped Sykes with his Board campaign in 2014, said the candidate’s dedication is one of his most impressive qualities — but his focus on improving student life isn’t his only extracurricular. Sykes hikes and camps in his free time, and binge-watches “Parks and Recreation” when the weather leaves him stuck in his apartment. Sykes, who is staying at Pitt for the 2016-2017 school year to finish his cooperative internship, said his favorite thing about Pitt is the small-town feel of the city — something he echoes in his leadership philosophy. “It’s important to try to build those mutual relationships by day one,” Sykes said of SGB representatives’ involvement with students. Sykes said his friends and Pitt’s community are a network of support and positivity, and he wants to use that network to make positive change as president.